This product replaces the older Ithaca 8000. 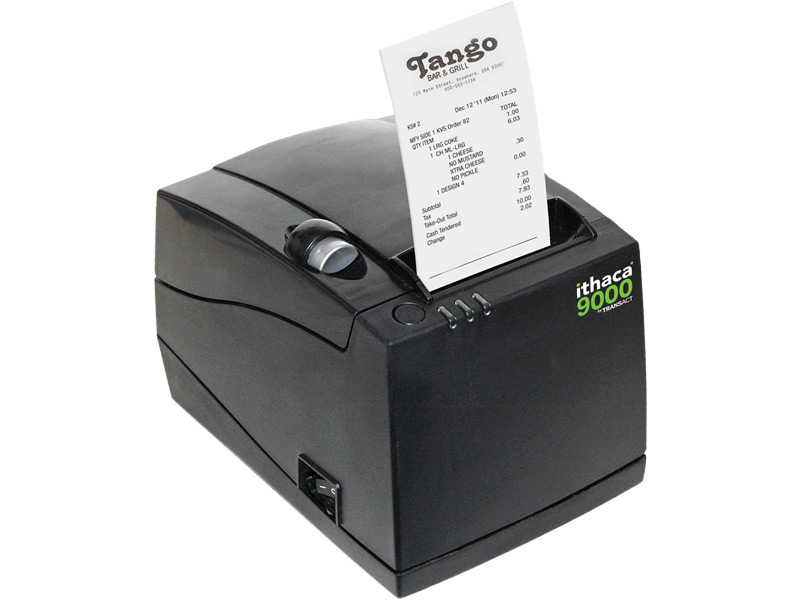 The Ithaca 9000 is a great option for quick service restaurants, coffee shops, and even standard retail operations. With support for a variety of media widths as well as label rolls, this printer is a versatile solution. The 9000 offers three different print styles in one body: thermal receipt printer, sticky receipt printer, and direct thermal label printer. A top print speed of a foot per second ensures receipts are printed promptly. The printer supports smaller roll widths, including 1.57" and 2.28", so you can be sure you have the right size media to meet your needs. And the support for sticky receipt paper means you can stick order receipts to bags, eliminating potential order errors. Ithaca's 9000 receipt printer is built to handle the high print loads you see in most fast food environments. The auto-cutter is rated at 1.5 million cuts, great for maximizing longevity before replacement parts are needs. The printhead has an effective life of 93 miles of receipts printed, further improving reliability. With a 2-year warranty standard, the Ithaca 9000 is a solid receipt printer for a variety of installations. Find it faster! Click here to compare 9000 models by feature.